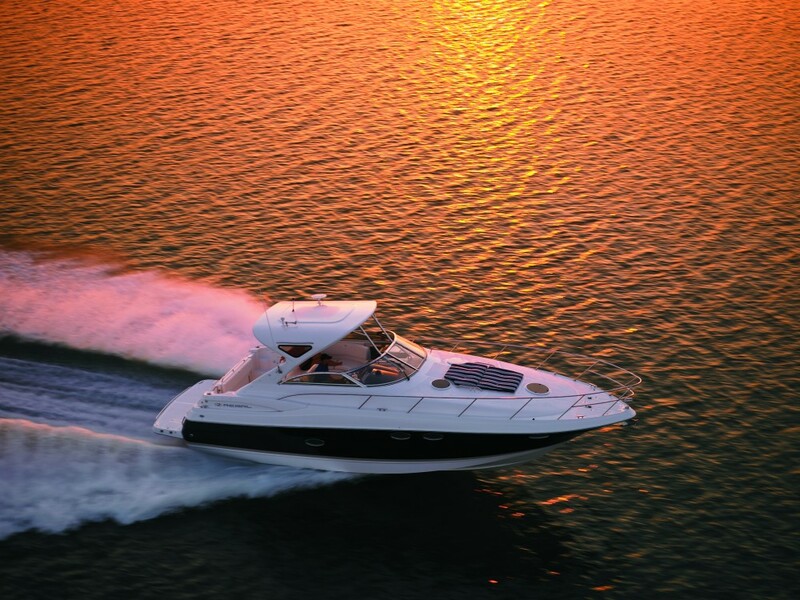 Regal Commodore 3060 turns any boater into a blue blood. The cockpit refreshment center has a sink and storage, and there is a hot/cold shower at the transom. A drop-down settee built into the transom transforms the L-shaped cockpit dinette into a U-shaped dinette. The new Regal Commodore 3060 has much in common with a Faberge egg: Created for royalty (well, for Regal Boats, if you want to get technical), the boat is a bejeweled beauty with sleek lines and an ornate interior that is sure to impress. 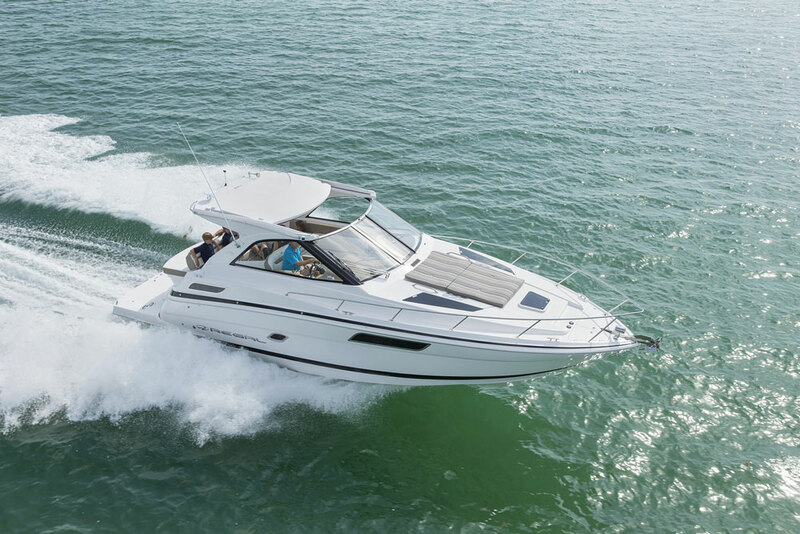 If you want to know the true measure of a boat, there's no one better to ask than an owner — and we did just that for our test of the new Regal Commodore 3060. J.R. Means from Bayport Yachts in Newport Beach, California was kind enough to set us up with Richard Quattrocchi of Placentia, California. Quattrocchi, a software developer with digitalQ, had just bought the Regal Commodore 3060 from Bayport Yachts a little over a month before our test ride, but he was happy to take us out for the day. We slowly motored out of Huntington Harbour, where Quattrocchi keeps the boat, and exited the jetty at the mouth of Anaheim Bay. Once we hit the open water, we headed north, toward the Long Beach breakwater. The 3060 easily handled the 3 foot seas, giving us a dry, smooth ride. There was no rattle or shuddering. In fact, we were having such a blast that it seemed as though we arrived at the breakwater in no time at all. It would be nice if we could do all of our ocean tests out of Anaheim Bay, because it offers the perfect chance to see how a boat performs both on the open ocean and in the calm waters behind the breakwater. We took the boat to wide-open throttle, to see how fast the twin 240 hp MerCruiser Alpha stern drives could take us with two adults, 75 gallons of fuel and a full tank of water on board. With the engines revved up to 4,500 rpm, we topped out at 43.3 mph. Although our test boat had the twin 240 hp EFIs, Regal will be putting comparable 260 hp MPIs on future models. 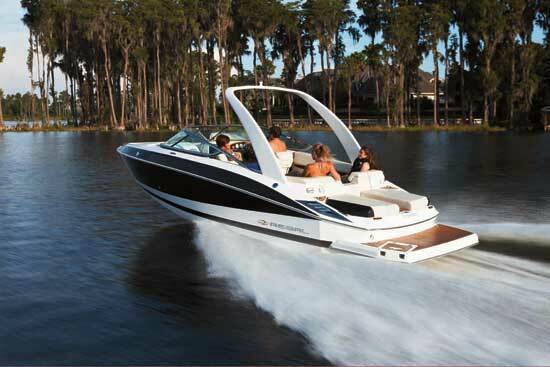 With the MerCruiser 5.0L MPIs, the boat can hit a top speed of 50 mph and it has an optimum cruising speed of 25 mph. No matter which engines you get, your mechanic is sure to thank you when he sees the huge engine hatches, which make it easy (for him or you) to get to the stern drives. Originally, Quattrocchi had no plans to buy a 30-footer. He had simply wanted a small runabout that he and his wife could use to cruise through Huntington Harbour and the surrounding waters. However, he slowly found himself being tempted to go larger and larger — especially after his accountant recommended that he get a boat with a galley, a head and a berth, so he could take advantage of the second home income tax write-off. 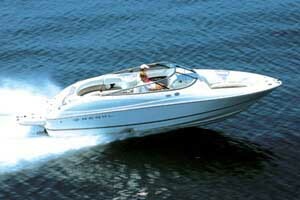 Quattrocchi is glad he chose the 3060, because it's a great size for cruising to Catalina for the weekend. In fact, he often goes there for five or more days at a time. The boat easily sleeps four adults, so he and his wife can invite friends along for the fun. When he bought his first boat, he didn't realize the "night-and-day" difference between just cruising for the day and staying on the boat overnight to eat, sleep and shower. With six years of boating experience now under his belt, though, he knew exactly what to look for this time around. For instance, one of Quattrocchi's favorite options on the boat is his Sea-B-Q brand barbecue, which stands on a pedestal that can be attached to or removed from the extended fiberglass swim platform with little trouble. The smell of fresh carne asada wafting forward from the transom intoxicates him. When he's not behind the barbecue, he is usually behind the helm — even if the boat is tied at the dock. The standard captain's seat spins all the way around to face the cockpit dinette, so he can still be part of the fun while sitting in what is arguably the boat's most comfortable seat. The woodgrain tilt wheel has power steering, and the standard instrumentation includes a compass, a depth sounder with alarm and controls for the stainless steel hydraulic trim tabs. 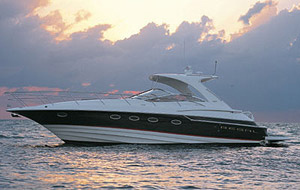 Optional equipment at the helm included a Raymarine Raychart 320 GPS/Plotter and a Raymarine Ray 53 VHF. Both of these additions seemed excellent choices, because they were sophisticated without being overly complicated. The cockpit refreshment center has a sink and storage, and there is a hot/cold shower at the transom. A drop-down settee built into the transom transforms the L-shaped cockpit dinette into a U-shaped dinette. Filler cushions can turn this entire area into a giant sunpad. 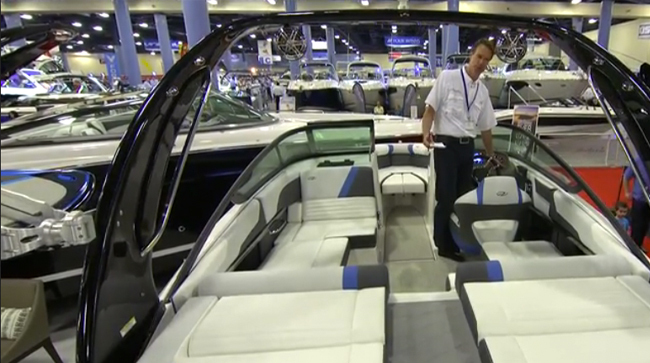 If you really like lying out under the sun, the snap-on sunpad on the foredeck will be another welcome feature. Two adults can easily catch some rays in comfort. 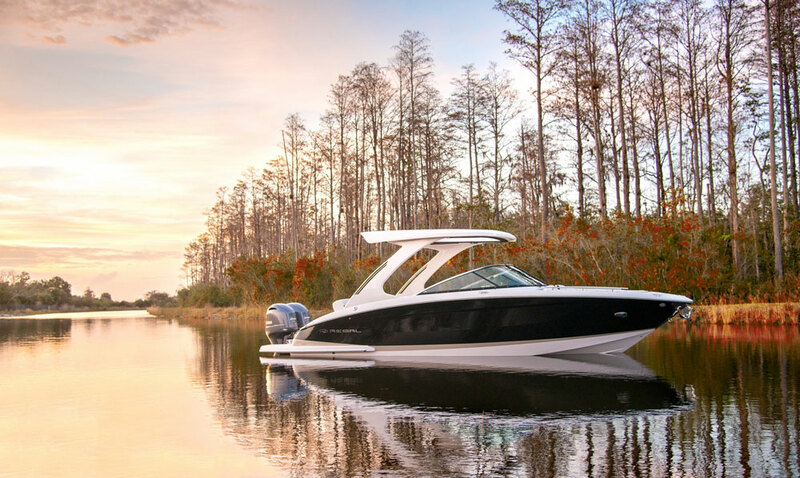 Many boat manufacturers are going with forward-swept radar arches on their new models, but Quattrocchi is very happy that Regal decided to stay with a rear-swept radar arch on the 3060. In addition to aiding visibility, the rear-swept arch design also makes the isinglass enclosure much larger, and easier to handle. 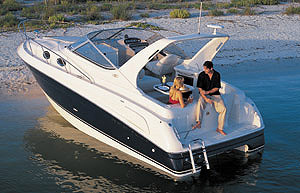 With forward-swept arches, you lose a lot of headroom inside the Bimini top. Quattrocchi's two favorite features on the 3060 are the grab handles built into the radar arch and what he calls the "big, heavy walk-arounds." Personally, we thought the walk-arounds could have been a bit wider — but maybe we just have big feet. When you go belowdecks, the full galley is to port, forward of the head. The galley sports a two-burner electric stove with a hideaway top, a built-in coffeemaker, a microwave oven and an under-counter refrigerator. The galley's stainless sink is amazingly deep. Accent lighting runs along the underside of the cabinets, and a convenient lip runs along the double-thick Corian counter. There are two full-size storage drawers under the counter, and when you open the doors, accent lighting illuminates what would otherwise be dark recesses. A trash bag receptacle is also down below. A small cedar-lined hanging locker is forward of the galley, and a 9 inch color television/VCR sits atop the locker. An antenna and a cable hookup are included standard. A fitted designer comforter covers the queen-size V-berth in an elegant tan fabric. Matching brocade pillows complete the look. There's a ton of storage under the berth, and when you're ready to call it a day, a full privacy curtain makes it easy to shut out the rest of the world. Continuing through the cabin in a clockwise motion, a full U-shaped dinette is abaft the berth. Quattrocchi can testify that it comfortably seats four adults. Moving farther aft, we come to the part of the 3060 that most impressed us: the midcabin berth. It's very rare for us to be so impressed by a midcabin berth — especially on a boat this size — but the spaciousness and versatility of this space was amazing. The U-shaped settee (yes, that's the third one on this boat) can easily be converted to a queen-size berth. In fact, this berth is even larger than the V-berth. Plus, the midcabin berth has a cedar-lined locker and two screen portlights that keep the space bright and welcoming. Instead of diamonds and gold, the Regal Commodore 3060 is made of fiberglass and stainless steel, but like a Faberge egg, its fine craftsmanship is on display both inside and out. Without a doubt, this boat makes the statement that "A true artist has been here." Bore and stroke 3.74" x 3.48"
Carpet runners, transom hot/cold shower, removable fold-down cockpit seat, bi-fold acrylic cabin door, exterior cockpit carpet, cockpit table w/filler cushion, water heater (6 gallons), helm seat w/leaning bolster, aluminum windshield w/walk-through molded-in nonskid decks, starboard windshield wiper, 120 AC/12v DC panel, automatic fire extinguishing system, battery charger/converter. Raymarine Raychart 320 GPS/Plotter, Raymarine Ray 53 VHF, cockpit refrigerator, VacuFlush head, anchor windlass w/chain, dual dockside shore power.